One of the key ways to grow your ePaper is to send a daily push notification to readers. Urban Airship found that publishers sending at least one notification every day have app retention rates more than twice as high as those for publishers that don’t. Twipe’s own research has found that engaging with your readers in the morning through a push notification increases reader activation by 15% throughout the day. With such great results, it’s no wonder that this ‘battle for the lockscreen’ will continue into 2018–according to research from Urban Airship, news publishers are sending 40% more push notifications per month compared to two years ago. A recent report from Nic Newman and the Reuters Institute for the Study of Journalism warned that platform companies may begin to filter messages that appear by default on the lockscreen–in essence “controversially not everything that is sent will necessarily get through”. With push notifications described as the highway to readers’ attention, it is important to stand out with your push strategy. These 4 guiding principles will help shape your publication rise above the noise. Successful newsrooms recognise push notifications as their own distinct content, instead of simply viewing push notifications as a means to an end for bringing readers to a piece of content. Adopting a conversational tone with a clear voice helps the alert to stand out. It is important to add context to the alert, as for many readers, it is the most they will read. This means that open rates are not as important in many newsrooms as they once were. Pete Brown’s report “Pushed beyond breaking: US newsrooms use mobile alerts to define their brand” found that many editors describe a successful notification as one that readers find interesting, but do not necessarily click to read more. 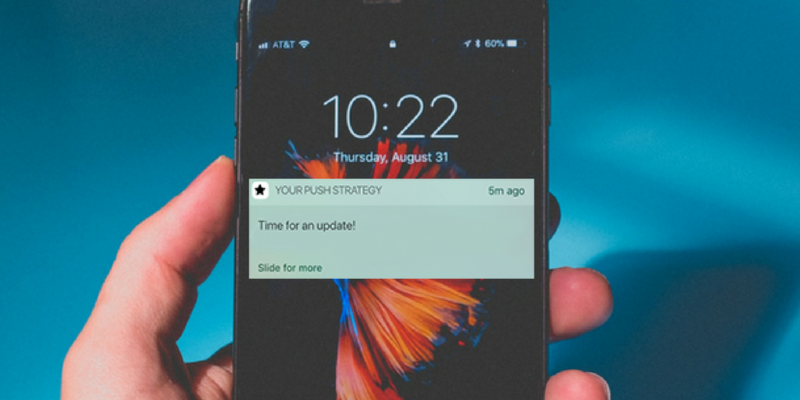 Nathalie Malinarich agrees with this need to redefine our view of notifications, writing that while we may have reached peak push, push notification strategies can still be enhanced. As a whole, push notifications are a great way to bring attention back toward publishers’ apps themselves, which helps to build brand loyalty—successful publisher recognise that push notifications are a valuable opportunity to remind their audience who they are and what they do best. Brown’s report highlighted a trend that many publishers are seeing: breaking news alerts are less likely to drive traffic to an app than editorial or long-form alerts. One way publishers have leveraged this trend is by sending follow-up alerts after a breaking news push with additional analysis or opinion about the news event—giving readers a reason to turn to your publication instead of other publications breaking the same news. In order to engage your readers, you first must understand what they are interested in. This answer is different for each audience, so it may first be necessary to experiment with your push strategy before determining your best practices. Recently there have been great innovations in push strategies, including The Guardian’s Mobile Innovation Lab that regularly blogs about their latest notification trial and the dedicated push notification team at The New York Times that recently experimented with emojis. 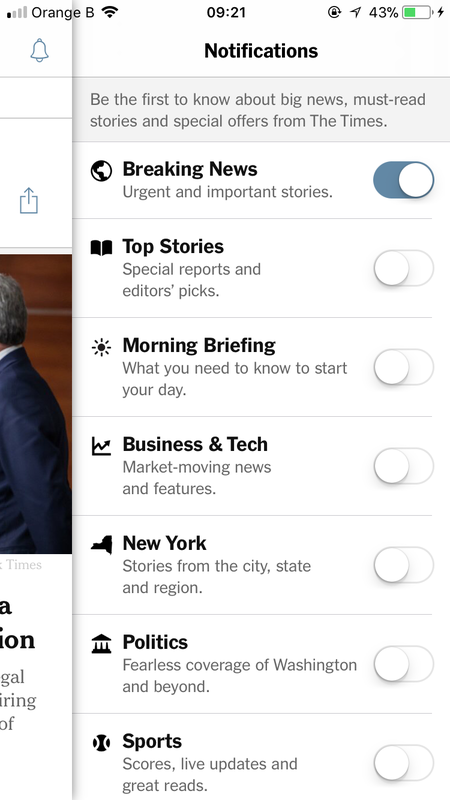 The New York Times is also a great example of segmenting push notifications by topic or type, with six different categories in addition to pure breaking news alerts. This segmentation is helpful in getting to know your readers because it both allows readers to tell you directly what they are most interested in and it also gives you more room to experiment with your strategy. For example, while The New York Times is read around the world, it still has a sizeable audience in its home state of New York. By allowing readers to opt-in to New York-specific alerts, they can experiment with engaging local readers without worrying about annoying non-locals into turning off notifications entirely. Jumping off the principle of building brand through push notifications, it is important to establish reader habits for your publication. In his book Hooked–How to build habit forming products, Nir Eyal identifies the 4 step process to create habit-forming products, starting with the trigger of a push notification. Even with edition based publishing, push notifications are key because they remind readers to read the new edition at a set time each day. For example, the 12 app from Tamedia sends a push to readers at noon alerting readers to the new edition. They found that many readers scroll through the stories once they receive the alert, then later that evening read the full stories that interest them. The push notification has helped turn reading the 12 app into a part of readers’ daily routine–and they know this because when push notification do not get sent, the edition’s download rate plummets. Just one look at the lockscreen above shows the importance of rising above the noise, but with these 4 guiding principles in mind, you’ll stand out on readers’ crowded lockscreens. This entry was posted in Industry news and tagged Digital publishing, Digital Strategy, ePaper, New York Times, Push Notifications, Reader Engagement. Bookmark the permalink.